This walk route provides a scenic view of the portion of the Reston National Golf Course that lies between Soapstone Drive and South Lakes Drive. This is a loop walk that provides views of the many homes on the edge of the golf course. 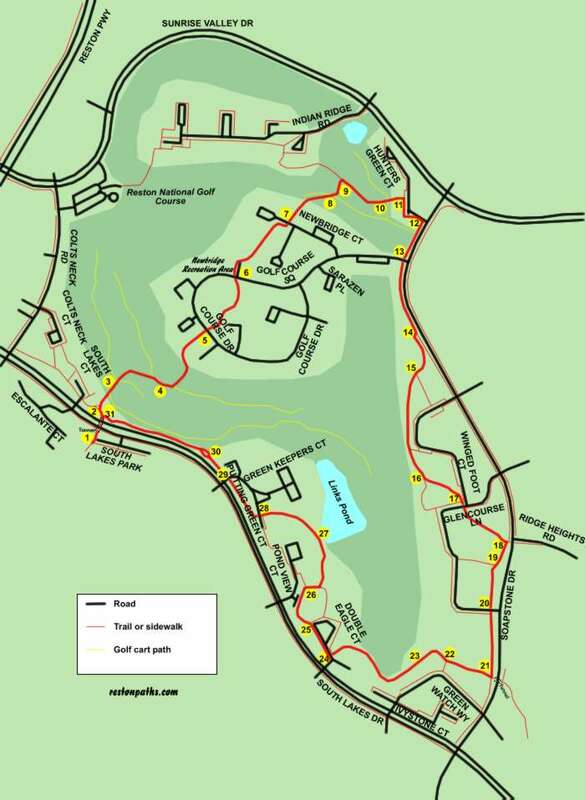 A portion of the walk is on Reston Association trails across the golf course. For a map and directions suitable for printing click here. You will need Adobe Reader to view and print this material. You will find a link to this free software on the Contents Page. This walk starts from the parking lot at South Lakes Park located on South Lakes Drive about 2 ½ blocks east of Reston Parkway. Take the asphalt path on the western side (Reston Parkway side) of the parking lot and turn right to enter the tunnel under South Lakes Drive. Upon emerging from the tunnel take the asphalt trail to the left. After a very short distance the trail splits. Take the asphalt trail to the right towards the golf course. The trail joins a golf cart path as it crosses the course. The trail crosses an intersecting golf cart path. Continue straight on the trail as it enters a wooded area, turns to the right and goes down a short hill. The trail joins a golf cart path for a short distance. Follow this path until an asphalt trail intersects from the left. Turn left and follow that trail in a curve as it goes up the hill between the houses. The trail crosses Golf Course Drive. Continue following the trail between the homes on the other side. The trail crosses Golf Course Square. Follow the trail on the other side adjacent to the parking lot for the Newbridge Recreation Area. The trail turns to the right for a short distance prior to the tennis courts. The trail crosses Newbridge Court. Follow the trail on the other side through a small wooded section and across the golf course. The trail crosses an intersecting golf cart path. Continue straight on the current trail into the wooded area. At the intersecting trail turn right and continue through the wooded section. The trail crosses a golf cart path. Continue straight on the current trail as it intersects with Hunters Green Court. At Hunters Green Court turn right and follow the sidewalk along that street. The sidewalk intersects with Soapstone Drive. Turn right and follow the sidewalk along that street. At the intersection with Golf Course Square continue across the street and continue on the sidewalk along Soapstone Drive. The trail crosses a gravel road into the golf course. Continue for a short distance beyond this and take the first intersecting asphalt trail to the right. An asphalt trail intersects from the left. Continue straight on the present trail and follow it along the edge of the golf course. The trail turns left and enters a wooded section as it leaves the golf course. Keep to the left at the intersecting gravel trail. After a short distance the trail goes around a play area. The trail crosses Glencourse Lane and goes between the homes on the other side and enters a wooded area. At the next trail intersection turn right to remain in the woods. Do not take the trail to the left across Soapstone Drive. A trail intersects from the right. Continue straight on the present trail along Soapstone Drive. The trail crosses Glencourse Lane. Continue on the trail on the other side. At the next trail intersection with a tunnel on the left turn right to walk away from the tunnel. A trail intersects from the left from between the buildings. Continue on the trail to the right. The trail follows the boundary of the golf course. Do not take any of the side trails. The trail crosses Double Eagle Court. Turn right after crossing that road and follow the asphalt path along that road. At the end of Double Eagle Court take the asphalt trail to the left of the homes. The trail joins Pond View Court. Stay on the asphalt trail in front of the first group of homes. The asphalt trail turns to the right between the homes. Do not take the concrete sidewalk that follows Pond View Court. An asphalt trail intersects from the right. Continue to the left on the current trail. Links Pond and the golf course appear on the right. The trail crosses Putting Green Court and turns right to follow South Lakes Drive. The trail crosses Green Keepers Court. Continue on the trail along South Lakes Drive. The trail splits for a short distance and rejoins. Continue along South Lakes Drive. Turn left at the trail into the tunnel and return to the parking lot at South Lakes Park.